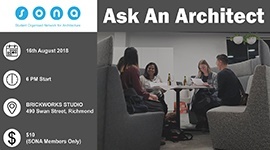 Architects from a wide variety of leading firms will be available to speak to on the night. Don’t miss this opportunity to expand your professional network in a casual, low-pressure setting. This is a night on everyone’s radars! There is a link on the website to buy tickets – $10 or register here.